Hey guys, I've decided to join the sharing here. I've been doing studies but not really sharing them. I love the Daggers so I'd like to be involved and maybe we can pump this thing up again!!!! I will probably livestream sometimes too. The figures I spent more than an hour, but I wanted to post them. 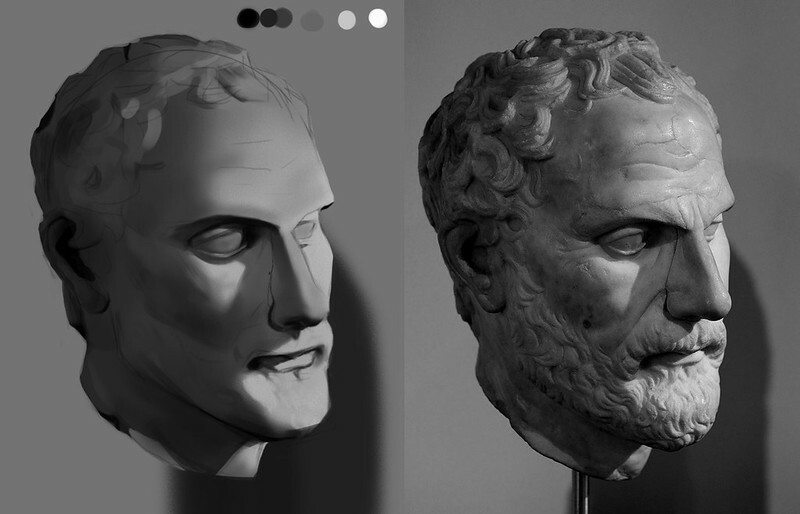 Trying a new subtractive work-flow for the Demosthenes bust. I liked the idea, but the idea when it came time to add values instead of taking them away I discovered marks I had made thinking I was on a different layer. -A frequent problem I tend to have with this particular tablet, which is why I almost always painting on the same layer. ;\ Trying to get in the swing of using clipping masks into my own workflow and better layer management. I found :this: article to be a bit helpful on the application of using color and building a palette from imagination. Here are some studies from today, always looking to get better at rocks and metal armor and such. Here they are, I just work and zone out, sometimes eat too in breaks so I have no idea on the actual time, I just stop when I think I have what I need. Would say about 1.5 hrs or so a piece. Some warm up studies, can always use some better portrait skills!! Also just a few gesture studies. Now I have the problem of too many sketches or gestures from imagination that I would like to take to finish but if I did that there would be no time for anything else!! 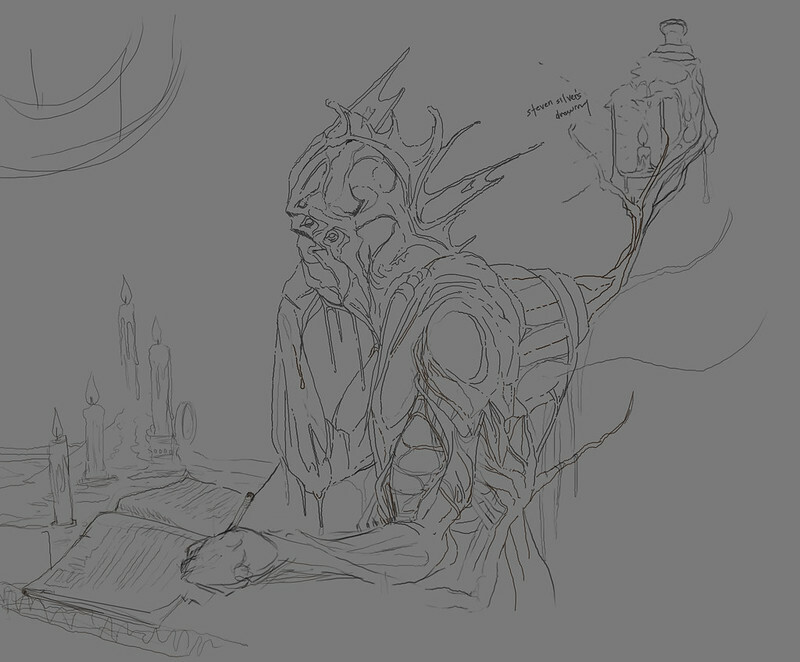 Oh well, maybe I can just do some quick characters or something like you would see on livestreams and stuff, not really finished but more conceptual. OK, so after playing around with the top left portrait, I realize I pushed the darks and lights and I did so intentionally after I hit about the 1 hr mark just to experiment. After looking at it for a while I decided to try a color version, which usually I would do an undersketch and start in black and white and use some color and overlay layers and stuff until I could start painting in some actual light skin tones. For some reason I just started picking skin tone colors and blocked in some stuff with no real underpainting, or as much as I would normally do. Colors look like crap so I decided to refer to some artists that have a little more experience in this kind of painting. So the master study is...crap the name eludes me. Beauger........aw forget it!! So the master paint was done kind of like a alla prima, with slight blending. It's really fun, going to do more of these for sure and try to apply them! something else we havent done much of is say some words on here about what everyone is doing..
Trevor- Try some still lives and look at the colors I would say keep focusing on the values first try zooming out and painting with a big brush, and squint as odd as it seems, but when your blur the painting next to the side by side comparison you really start to see the differences in value. Keep up the hard work buddy! Also to help out with the sketches try to take a gesture that you did and bring it to a real rough black and white character. Helix- I like what your did there I would suggest a good thing to do is use the blur and blur the reference photo out so you see mostly the hue changes off the top of my head I cant remember which blur to use but when you do it get try to see if that helps. Also thanks for the article will definitely read this! everyone else- KEEP IT UP GUYS!!!! 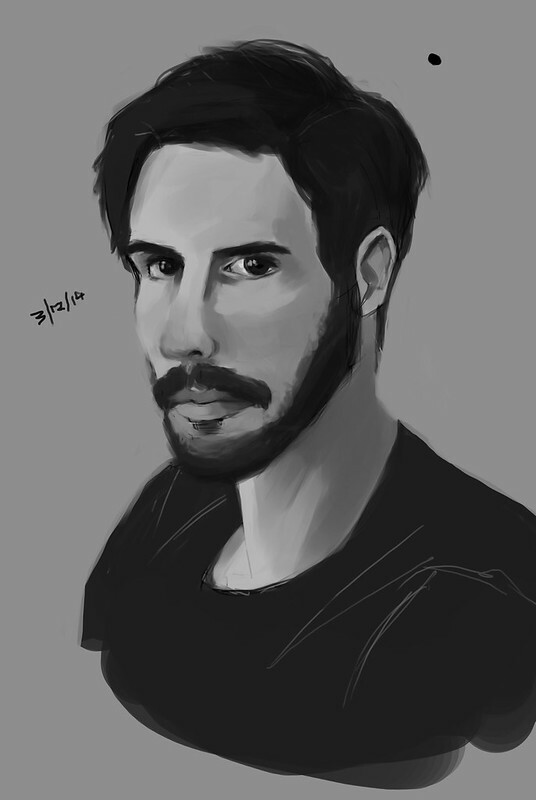 Spent more than an hour, maybe an hour just on the face. Love the way they use high key palettes on the skin tones, something I've never really done, but I'm fond of. 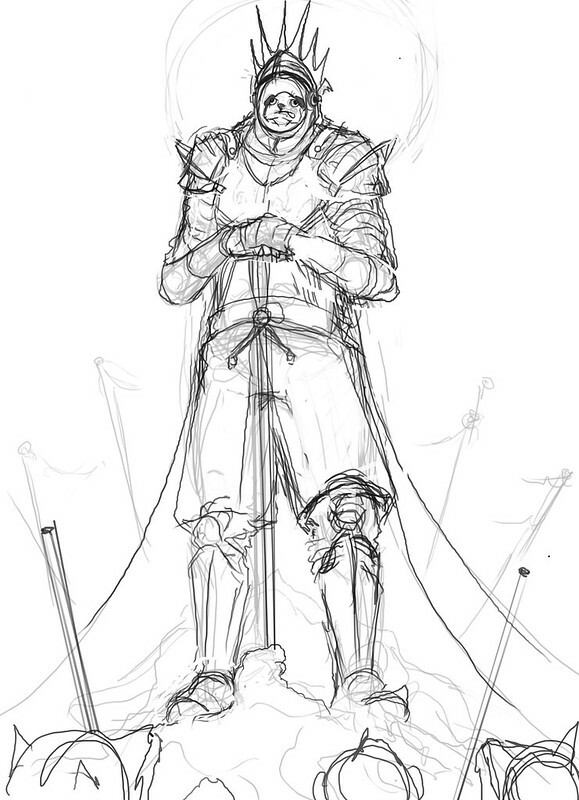 Another armor study from today. Just trying to be quick and imply detail rather then render everything out, but I'm not quite there, not at all, still rendering mostly. I think it was more than an hour, I lose track of time, all the time!!! more gestures and some clothing/material studies along with another clothing study of dr.doom. Been in the hospital, some Bridgeman studies while I've been here. Here are some recent studies that I've been doing. Starting to feel like I'm painting with light on some of the lighting studies from movie stills. Waited until I had a full page to post anything. Been busy with that child of zeus contest as well as a recent commission to do a album cover!!!! First real commission and they found me! Awesome feeling!! Some of these studies are longer than an hour, I don't stop until I have what I need to know. Same here, we had a good thing going ); It'd be cool to try and round up some people and get a group mentality going again, seems art groups ten to lose their flame relatively quickly now a days. Everyone has different focuses they are trying to improve. General fundamental study a day is something most can put some time into though. 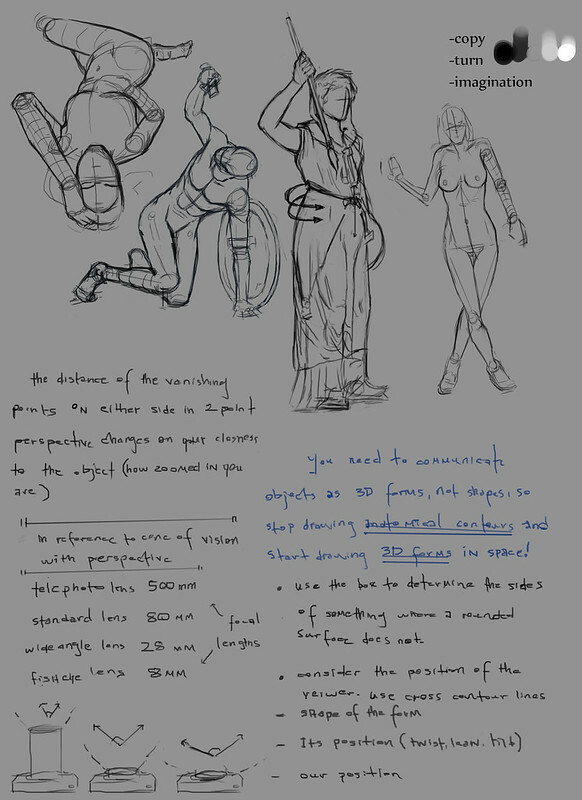 I'm reviving the :Daily Study thread: for anyone interested! I'm currently polishing my lighting scenarios and form. feel free to get involved/message me for critiques, comments and general harassment! 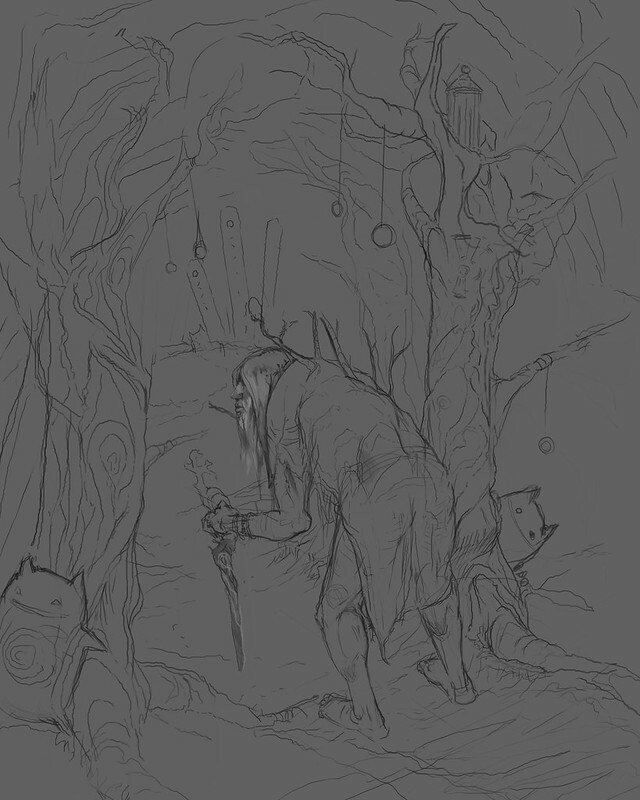 D: You shouldn't have to spend a large amount of time on this however spend as much time as you need, give it your best. E. All Projects/Exercises are of course optional, have no order, and are always open to participation. Start wherever and whenever you want! F. People who are too embarrassed to post their results will be shot on sight, you're here to learn not to show off." pretty raw; lots of exploratory marks. It might be good for me to write out a concept beforehand. 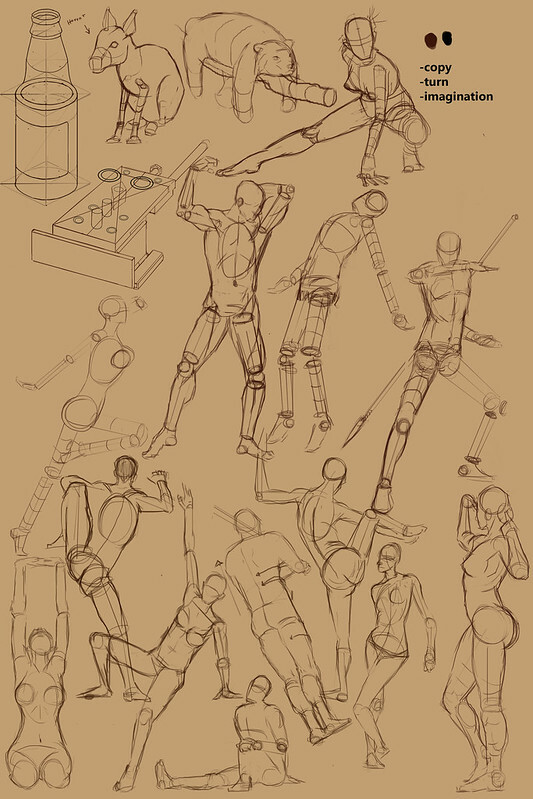 I'll pop in, Doing daily figure studies every morning. Also I did a little adjustment/paintover for your figure study, something to just watch out for. Although I don't think it was a focus of the study. one product of sketch night here in town.